Retirement can provide the time to develop a garden rich in sensory elements which evoke powerful and pleasurable memories and experiences. As we age, some of our senses can become less sharp, but with thoughtful planting and landscaping, a garden can be the perfect place to stimulate them. For those with poor eyesight, flowers, fencing and furniture in the colours of blue, white and yellow can work best, while berries, bark and foliage add natural colour throughout the seasons, and the use of evergreens provide all-year-round structure to your space. Encouraging nature into your garden will provide a natural chorus of sounds to neutralise urban noise if you are spending more time at home. Placing seating near to water features provides a backdrop of relaxing tones, and crunchy gravel or crushed shell mulch provide audible texture underfoot. Scent has a strong association with memory so be sure to include scented plants around your garden. Scented climbers like jasmine and honeysuckle, or roses around arches and doorways provide scent at head height. If you struggle with your mobility, then raised beds are a good option while seated and allows the scented flowers to bring their perfumes closer to you. Lamb’s ear is woolly and soft to touch – great if you have young grandchildren exploring your garden. And surfaces such as smooth pebbles warmed by the sun, cool granite copings, carved wood or polished metal can all bring interesting textures into the garden too. Growing herbs is an easy undertaking for a gardener of any experience. They don’t require as much space as a vegetable patch but add plenty of flavour to your meals. If you have more time on your hands and are looking to start a ‘grow your own’ section then why not start with oregano, sage, fennel, thyme, chives and rosemary. 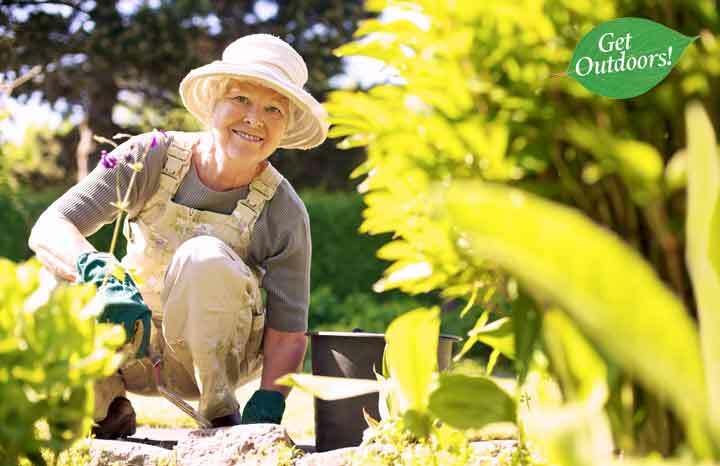 Retirement can also provide an opportunity to develop an accessible garden which can be enjoyed for many more years to come. 6. Think about new garden-related hobbies you might like to take up in your new leisure time, such as bee keeping, willow weaving or keeping chickens – gardens can be easily adapted to incorporate space for new activities. 7. Adapted tools can save you a sore back or tired arms – do your research to find out which ones suit you best. 8. Growing your own veg can save you money, increase the amount of exercise you do and get more healthy food into your diet. 9. Gardening with the grandchildren can ignite an early passion for gardening and create treasured memories. 10. If you struggle to get outside all the time, think about placing some beautiful features near the back door so that you can see them all year round. This summer, award-winning garden designer Tracy Foster and Just Retirement Limited, a leading specialist in retirement products and services, will unveil a show garden at RHS Hampton Court Palace Flower Show (30 June-5 July) that celebrates the joys of retirement.